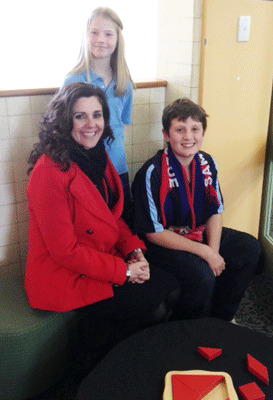 Our school's Network Leader, Judy Hamilton, regularly visits our school. Below is a photo of Judy speaking with Raph and Bec from year 5. Students don't have to be school captains to be considered leaders. We encourage our students to be leaders in the classroom and playground, through their support for other students, or their involvement in academic, sporting, cultural or community events and projects. 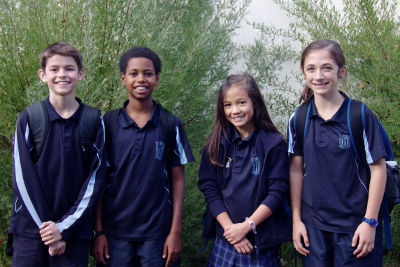 The school captains are the student leaders of the school and are elected by the student body. Students elect the following year's captains from 10 year 5 students who have been short-listed by their year cohort. The school captains represent the student body at internal and external events and participate in the school decision-making process. The Student Representative Council (SRC), is a program which actively involves students in their own education and wellbeing, develops leadership skills and empowers students to make a positive contribution to the school community. The Student Representative Council promotes activities such as discos, school initiatives and fundraising in the interest of creating a safe school environment and a positive school culture. Money that is raised by the SRC throughout the year is used for student driven projects across the school and as donations to charities. Ainslie's buddy activities are designed to help create a friendly and caring school environment at school. The activities build strong relationships and research shows children benefit immensely - with younger students feeling safe and cared for, and older students feeling valued and respected. Ainslie school hosts several student interest groups every term before school and during the lunch time break. Activities such as gardening, choral work, dance, library activities, creative arts, science club, structured strategy games and chess are offered to students during their break.